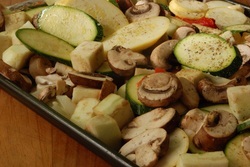 Place cut vegetables in a 13x9 baking dish. Pour dressing over vegetables. Bake 25-30 minutes or until tender. Add diced chicken or sausage and make it a meal!